Retirement | Community Living Inc.
Retirement — some of us can’t wait, while others dread the prospect. For most of us, retirement is something we dream of and plan for, for much of our working years. The same is true for the senior citizens with developmental disabilities served by CLI. Once they have retired from their day programs or jobs, these seniors need daily activities that will stimulate, challenge, and allow them to contribute to their community, while monitoring general physical health, and offering companionship, structure and guidance. That’s why Community Living created its senior day program, Retirement Our Way, or ROW. ROW is a day program created specifically for seniors with developmental disabilities. 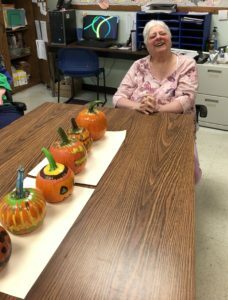 The program is based at the Community Living office in Frederick, but participants routinely travel all over town and the county for various activities and events. ROW seniors attend public functions and participate in county senior programs. They get involved in arts and crafts, woodworking, gardening, picnics, field trips, bingo, bowling, golfing, cooking, exercise programs, mall walking, eating at various restaurants, and fishing. They shop, get manicures, get their hair styled, visit nursing homes, go out for coffee, and enjoy guest entertainers and volunteer companions. ROW is staffed with experienced personnel who have had extensive training. All staff members are certified in both CPR and First Aid. A nurse is always on duty at Community Living, and provides regular monitoring as part of the ROW program. These nurses also arrange doctor appointments and oversee administration of all necessary medications. The Retirement Our Way day program operates from 9 a.m. to 3 p.m. Monday through Friday. Schedules are personalized for individual needs and desires (some of our seniors attend just one or two days per week). An activities calendar is published monthly in order to assist families and caregivers with scheduling. Transportation can be provided for an extra fee. For more information on the Retirement Our Way senior day program at Community Living, or to apply, contact info@communitylivinginc.org or call Michael Planz, CEO at 301-663-8811.